Today, am sharing another one of my winter favorites from Biotique. We are right in the middle of winters and my lips are severely dry and chapped to the extent of bleeding. Which is actually good, as this is the right time to put this Biotique Bio Almond Overnight Therapy Lip Balm to test 😛. I have been trying out a lot of lip balms now. So I can do a comparison with other lip balms as well. 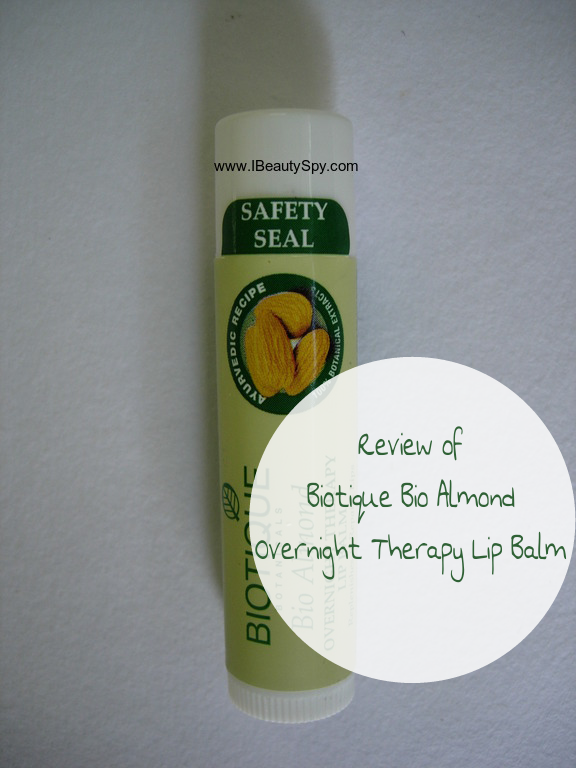 Read on to know my experience with Biotique Bio Almond Overnight Therapy Lip Balm. This soothing balm deeply nourishes and fortifies lips. Tone, texture and firmness are improved overnight. Madhu (Honey), Vach (Acoruscalamus), Mulethi (Glycynhiza glabra), Was (Prun usamygdalus), Surajmukhi (Helianthus annus), Kashumbi (carthamus tincorius), Til (Sesamum indicum), Erandi (Ricinus communis), Marhum base Q.S. Rs.149 for 5g and Rs.175 for 12g. 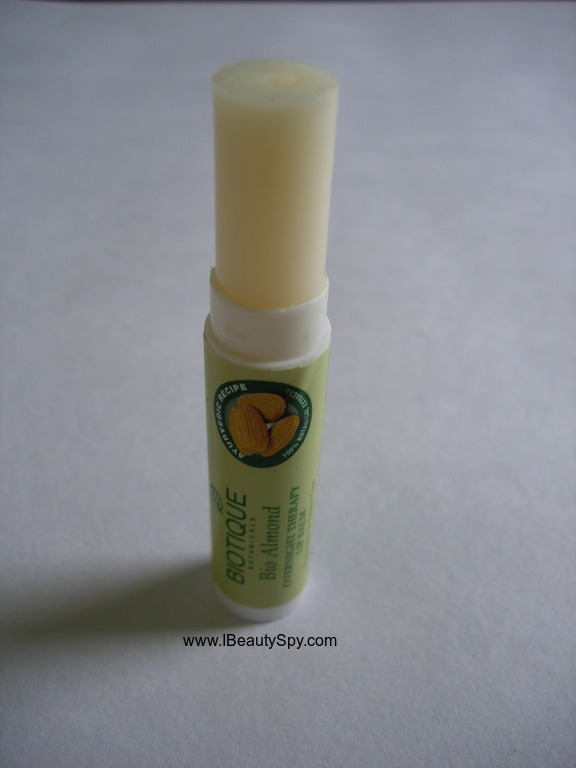 Biotique has revamped their packaging and now the lip balms come in a twist-up chapstick form. Previously, they used to come in tubs and many people avoided it for that only reason. I love their new packaging as I can easily apply on the go. Kudos to Biotique for this new improved packaging 😘😘. Biotique Bio Almond Overnight Therapy Lip Balm is colorless and so perfect to be worn under lipsticks. It has a faint smell/flavor of almonds which I love. We all know almonds and honey are very good for the lips. Imagine getting the goodness of both in a lip balm! It is a sure way to treat your lips. The lip balms glides on my lips easily. It doesn’t leave any whitish cast. It makes my lips smooth and soft instantly. The best thing about the lip balm is its staying power. It stays on your lips for a long time and even survives water and light snacks. I have a habit of sipping water very often in my office. And I get really annoyed that many lip balms don’t survive even 2-3 sips of water. 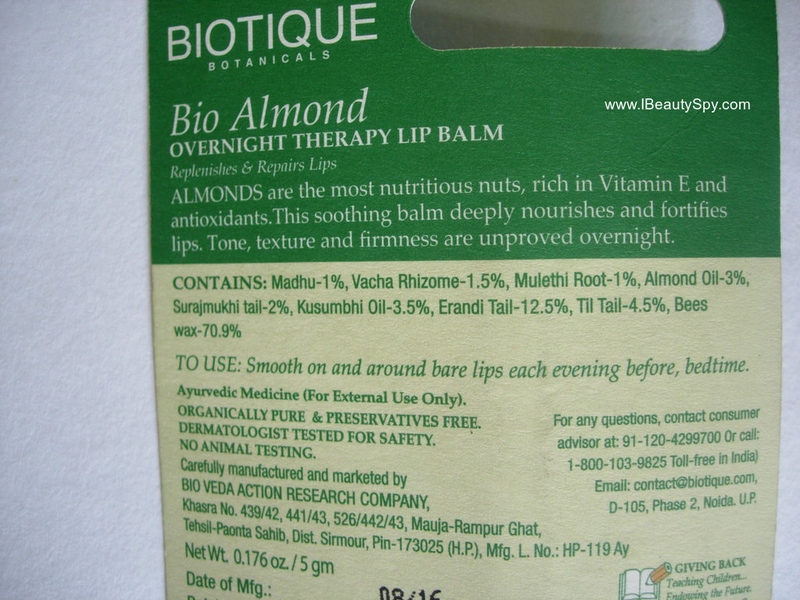 I am really impressed with the staying power of Biotique Bio Almond Overnight Therapy Lip Balm. Before using this, my lips were severely dry, chapped and bleeding. I had few lip balms and was trying them to see if any of them can cure my lip condition. So let me do a small comparison here. My first try was Kronokare The Frizz Kiss Cooling Explosion Lip Balm. It worked little but I saw no major changes in my lips. Secondly, I tried the Just Herbs Liquorice Shea Lip Butter Balm. It didn’t work at all. There was no improvement in my lips. Thirdly I tried Spa Ceylon Wild Mint Lip Balm. It worked somewhat well but the results were slow. 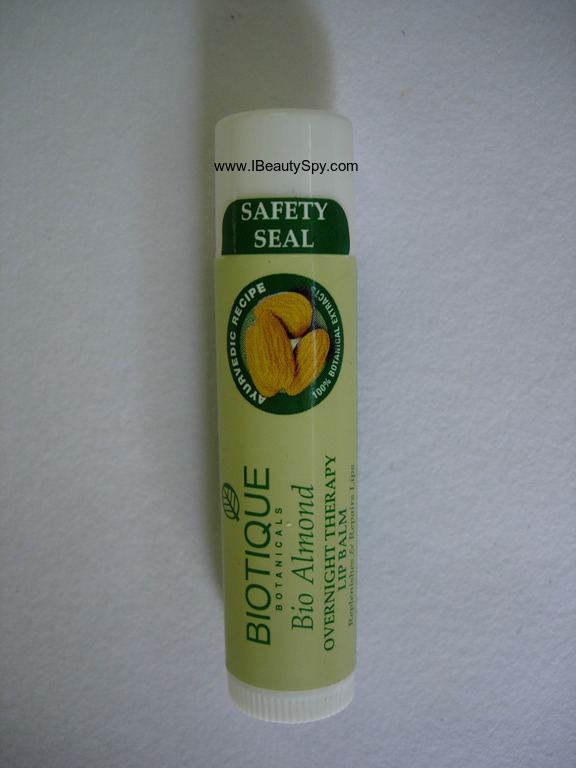 Biotique Bio Almond Overnight Therapy Lip Balm was my fourth try and believe me, my lips were totally healed within 3 days. It became smooth, soft and nourished. Even after I stopped using it, the effects lasted. Unlike silicone and petroleum jelly based lip balms, which make you want to reapply very often, I don’t feel the need to reapply this. Another good thing about the lip balm, it doesn’t feel waxy or heavy on the lips. It feels very light and I don’t feel like I have applied anything at all. It can serve as a perfect base to your lipstick. It claims that ‘Tone, texture and firmness are improved overnight’. I could actually feel that my lips were toned and firmer. Does it satisfy all its claims? Yes, it satisfies all its claims. * Heals dry and chapped lips. * Nourishes lips and makes it smooth and soft. * Survives water and light snacks. * Effects last even when you stop using it. * Doesn’t feel waxy or heavy on the lips. * Tones and firms lips. * Makes a perfect base for applying lipstick. * Contains the goodness of almonds and honey. * Natural, organic, preservative-free and cruelty-free. Mention all the ingredients in packaging instead of only key ingredients. 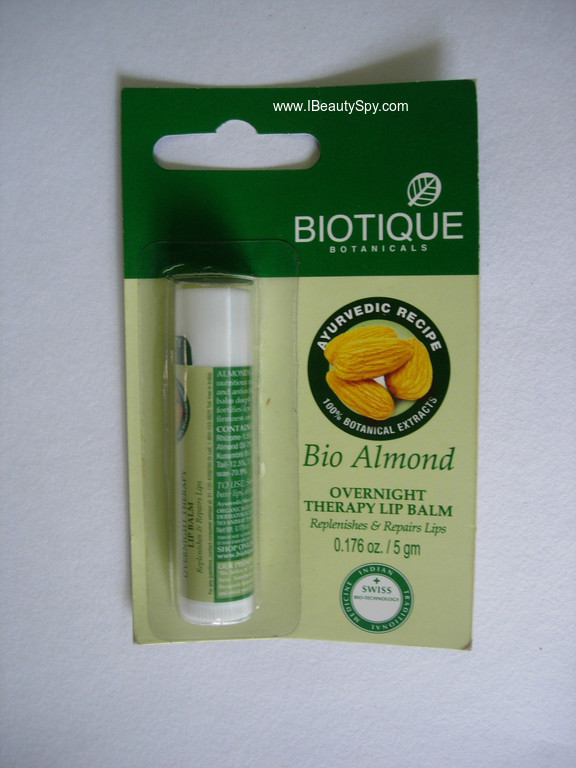 True to its name, Biotique Bio Almond Overnight Therapy Lip Balm is not just a lip balm but a therapy for your lips. If you are facing dry and chapped lips this winter, give this one a try. Am sure you will love it! Do check out my reviews of other Biotique winter care products here. P.S Product sent by the brand for consideration. But my opinions and reviews are unbiased and honest as always. Thank you Sonali 🙂 Biotique products are really good. Do give them a try. Seems good lip balm. Would love to try it. Nicely reviewed.